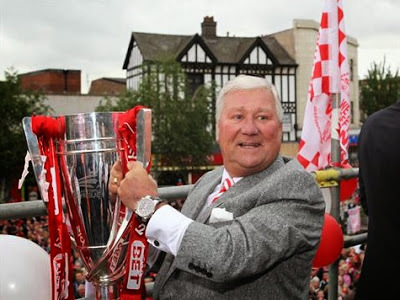 Local businessman and chairman of Rotherham United, Tony Stewart, is to be admitted as an Honorary Freeman of the Borough at the Town Hall today. The owner of Rotherham firm, ASD Lighting is receiving the honour in recognition "of his eminent service to the sport of football and his long and friendly association with the Rotherham Borough." At a special ceremony being held at Rotherham Town Hall, the Mayor of Rotherham, Cllr John Foden, will present Tony with an illuminated address bearing the Coat of Arms commemorating his enrolment. He will also receive a pendant and will be asked to sign the Roll of Honorary Freemen. Tony is to be granted the award after members of Rotherham Borough Council approved a motion moved by the Leader, Cllr Roger Stone, at a council meeting in July. Cllr Stone said that Rotherham was a town on the up and part of that journey has been mirrored by the amazing achievements of its football club. He added: "It is true to say that none of this success would be happening without the innovation, determination and sheer hard work that Tony has put into this club. I am sure that every Millers fan will join with me in agreeing that Tony has raised this club to an exceptional standard." Tony Stewart becomes the 15th man to get the accolade and the third connected with the club. World Cup referee and honorary ambassador at RUFC, Howard Webb received the honour in 2011 and Brian Chapple, who works on the community side of the football club, was named as a Freeman of Rotherham in 2013. Born in Sheffield and brought up in High Green with a twin brother and four other siblings, Stewart was a Yorkshire Champion for running the mile. After leaving High Green School he undertook an apprenticeship as an electrician before starting in business aged 26 in a fast growing electrical contracting firm. Stewart was intrigued by infra red detectors and went on to combine them with lighting products which made them turn on "as if by magic" in 1981. After further design and development, and securing start up cash from the bank, it led to the formation of ASD Lighting, a Rotherham manufacturing success story. The Barbot Hall company has had unrivalled success in the LED market and has invested heavily in facilities and R&D. It employs around 200 staff and the latest financial results showed that turnover was £21.4m and pre-tax profits were £3.7m in the year ending 31 December 2012. Tony Stewart was one of a number of business people invited to the Town Hall with the aim of finding a way of resurrecting the borough's football league club after it fell into administration for the second time in 2008. He ended up going it alone and brought them out of administration via a Creditors Voluntary Agreement. After the takeover came the decision to play home games at the now demolished Don Valley Stadium in Sheffield, after working hard to get a deal to carry on playing at Millmoor, the club's home for over 100 years. The club was charged with returning to play home games in its home town within four seasons by the Football League and Stewart, with the backing of his directors at ASD and the club, threw his drive, energy, business sense and money into creating the £20m New York Stadium on the edge of Rotherham town centre. The iconic stadium hosted its first game in July 2012 and the Millers went on to secure promotion that season with an average attendance of just short of 8,000, the club's highest since 1982/1983. The second season, which saw even higher attendances and more sell-out games, culminated in The Millers securing promotion to the Championship in dramatic circumstances at Wembley. The "adventure" goes on with the club set to play its first home game back in English football's second tier tomorrow. Rotherham United Football Club now employs over 100 people and brings a wealth of benefits to the community and will contribute further wealth to the local economy with the future development of the remainder of the stadium site.